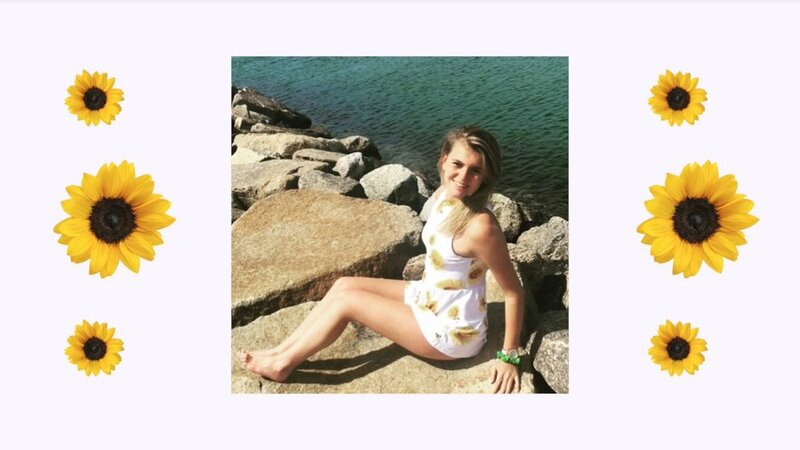 Julia’s collection was made in honor of her best friend who passed away last September, pictured above. Julia DeNey, and New Canaan, CT native, debuted her Level 3 childrenswear collection this past Saturday at our 35th annual show. 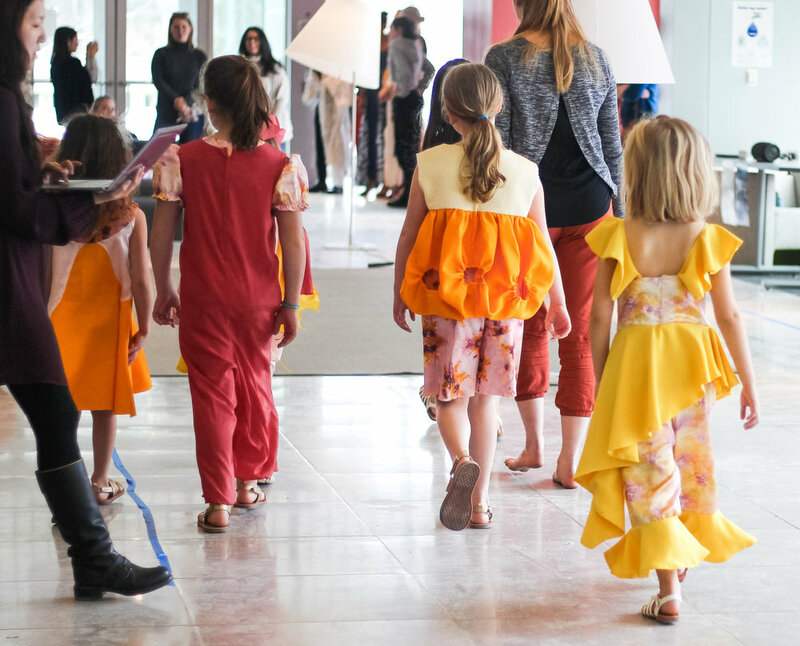 The fashionable child models, always a crowd favorite, rocked the runway with confidence and pep in every step. Among her favorite pieces includes a dress with a toke of hand dyed fabric, curved design lines. Another standout piece was a pant and top set also made with naturally dyed fabric with an asymmetric skirt on the top. Before the show, Julia told us she hoped the audience would leave “smiling and grateful for the friends in their life, and leave inspired to text, call, or snap a friend they haven’t talked to in a little bit.” She hopes her collection sparks encouragement for others to stay in contact with loved ones and cherish every moment they share. “My collection derives inspiration for the joy, adventure, and brightness that best friends infuse into your life,” Julia tells us. Bright, warm colors were prevalent throughout the collection, as well as a sunflower motif being used in various ways and displayed on the digital backdrop throughout her show. Not only are sunflowers one of Julia’s favorite flowers, but they also invite connotations of warmth and summer memories with her best friend who passed away this past September. Julia’s bright and heartwarming collection is in honor of her late friend who had a profound impact on Julia’s life since her middle school years. Her friend dared to challenge Julia to explore the world and test her boundaries, never afraid to get her out of her comfort zone. Thank you, Julia, for sharing your colorful and energetic collection with us! We can only imagine her amazing childrenswear collection would make her friend proud. Meet Joyce-- a senior FSAD major from Michigan, Level 4 designer, and Cornell Fashion Collective’s Vice President of Designers and Models. Joyce is a humble and talented designer dedicated to CFC. In fact, when asked about her involvement on campus and favorite past-time activities, Joyce admitted that “95% of her time is dedicated to Cornell Fashion Collective.” Her dedication to the organization and her attention to detail most definitely are revealed through her amazing work. When Joyce approaches her work, she keeps the cycle of the fashion industry in mind. “My goal is to design something that hasn’t been done before.” Joyce dislikes how many designs are copies nowadays but acknowledges that there aren’t enough ideas to match the speed of how fast people want things. “There becomes this tendency for people to replicate/repeat designs, but the quality of materials is also important,” she explained. In terms of priorities, Joyce prioritizes the visuality first and quality second. “Just because I want to get something done, doesn’t mean it has to be poorly constructed. When you're on a tight schedule though, sometimes you have to sacrifice some of those principles.” Joyce’s biggest obstacle has been working on a time crunch, as she sacrificed small details and the quality of some pieces in order to finish in time for the show. Defying expectations is a trend throughout Joyce’s work. In fact, her designs are inspired by very abstract ideas and emotions, which she translates into visually impactful pieces. In terms of silhouettes, Joyce is inspired by the complicated and surrealness of 1920s designs. “Similar to Moulin Rouge-- not entirely burlesque but similar.” For this collection, the theme is exploring and celebrating the contemporary female psyche. Joyce’s collection mainly focuses on representing the craziness of womanhood, and how it’s traditionally been something perceived as negative. Joyce’s shih tzu Cookie often keeps her company while she works in studio. When asked what most excited Joyce about the show, she responded: "to catch up on sleep once it's over!" Honestly, relatable. Jokes aside, her sleepless nights and hard work have led to amazing designs. Joyce's dedication to Cornell Fashion Collective is truly admirable and her persona empowers others just as much as her designs do. Not only has Hansika Iyer been a dedicated CFC member the past four years, but is also senior majoring in Fiber Science and participates in a variety of campus activities as a Mental Health Advocacy chair for the South Asian Council, dances on Cornell Big Red Raas, and is president of the Cornell Fashion Industry Network (CFIN). The Massachusetts native shares details with us about her upcoming collection that revolves around issues of sustainability and fashion ethics. Hansika’s collection is made entirely out of factory waste scraps from ADAY, a sustainably minded technical womenswear brand. Each outfit is consciously designed to minimize waste and use scraps innovatively. Hansika’s collection is crafted with a specific goal in mind: to get consumers to start thinking about their clothing consumption and waste. “Fashion is an art form, but it also leaves so much waste and damage in its path,” Hansika explains. Seeing as though almost 80% of textiles that are manufactured end up in a landfill, it’s no wonder she urges her audience to consider how their choices in where they shop can impact the world. But what’s Hansika most excited about for the CFC show? “Honestly, getting ice cream with my parents when it's over!” Same, Hansika, same. Chicago native Mia Campolo ‘19 is an FSAD senior and 4th level designer for CFC. “I have been waiting to show my senior collection for 4 years!” Mia tells us. Throughout her years in CFC has given her the opportunity to become more familiar with garment construction, a skill that will allow her to create more feasible sketches for brands she works for in the future. Her Instagram (@miacampoloportfolio) showcases her incredible fashion illustrations— we can only imagine what her collection has in store! Mia originally became interested in fashion design when confronted with the problem of finding clothes for herself that fit short women, without having to go to the kids section. Since coming to Cornell, Mia has tried to use her designs to experiment with the unexpected---pairing together untraditional patterns and colors. Another constant throughout her work, which she just realized after looking back through her past designs, are hard, divulging lines that interrupt and challenge the onlooker. Mia’s upcoming CFC collection is inspired by the history of sexism in the production of mens and womens clothing. When asked about her inspiration, she states that the example that prompted her exploration of the topic is how womenswear traditionally was never made with pockets. The reasoning behind this is to due to men not wanting women to be able to carry their own money, weapons, identification, etc. Thus, an expectation was set that a woman could never go anywhere on their own without a man. With this collection she intends to push the meaning of gender by mixing masculinity and femininity into womenswear. This idea comes to play in her designs through the combination of lapels and suit-derived elements with bloomers and lingerie. Mia says that some of her original ideas for the collection were harder to execute than expected going from 2D sketches to the actual 3D garment and it is a challenge to make all of the pieces in the collection seem cohesive. However, even though there’s a lot of stress, Mia has been planning this specific collection since junior year and has been looking up to CFC seniors since the beginning of her college career. Mia is sad that this will be her last show with CFC but she’s excited to see all of her hard work come together and be seen by all of her family and friends. 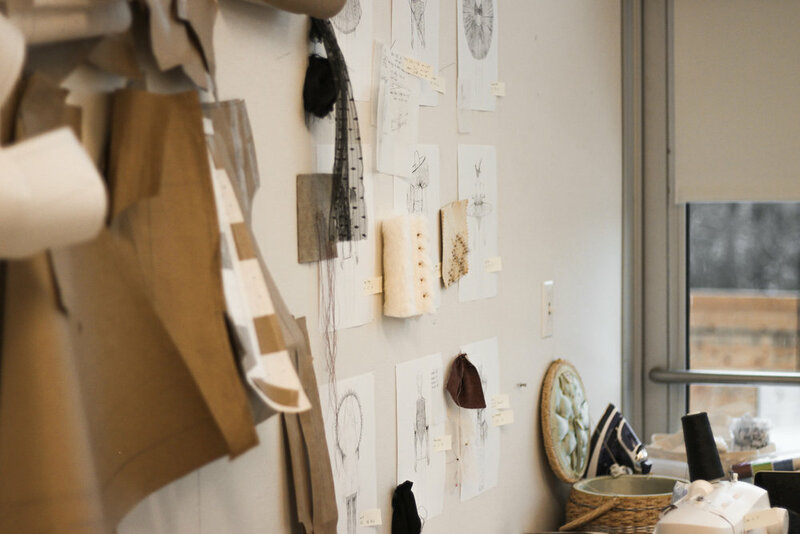 The Cornell Fashion Collective enables designers to reimagine trends and incorporate them into their own designs. As a Level 4 designer, Cassidy Lewis, a senior from Planeview, NY, has participated in the CFC Fashion Show since her freshman year. For her, the biggest difference about this year is her ability to show a fully culminated collection. She is excited to show her original ideas. Her inspiration originates from royalty, with the added twist of incorporating what a woman from this time would wear if the world wasn’t always a patriarchy. Her collection adds a feminist twist to a traditional theme. She is most excited for her final piece to walk the runway; she is keeping the details a surprise, but expect a big gown with a lot of movement. Cassidy explained that there is a lot of anticipation leading up to the show, and she is most excited for the day of the show, when all of the designers’ hard work can come to fruition. She can’t wait to display her pieces, as well as the creativity and artistry of the other designers. Jessa & Sloane: Where Are They Now? I thought I would check in with our two of our favorite e-board members from last year - Sloane Applebaum, last year’s VP of Finance and Management and Jessa Chargois, last year’s CFC President! They both graduated last spring and we couldn’t miss them more. Keep reading for life updates, and some excellent advice from two of your CFC faves. Question: I miss you guys! What are you up to now? Sloane: I live in Cincinnati, Ohio. I work for Procter & Gamble and I’m a process engineer in our Fabric Care division, so I work with laundry brands like Tide, Downy, and Gain. Most of my responsibilities are focused in managing and optimizing inventory across our supply chain. Jessa: I now live in New York City, working for Peerless Clothing, the largest manufacturer of men's tailored clothing in North America. On a daily basis, I work with the buyers of major retailers and specialties stores to bring tailored clothing to the masses. Peerless Clothing manufacturers and designs for countless brands, such as Calvin Klein, Ralph Lauren, Tommy Hilfiger, and Michael Kors, to name a few. After work, I freelance write for Chillhouse's online publication, The Chill Times and the luxury resale site, Heroine. In my personal life, I've been working to balance self-care and work, trying to navigate the busy life New York City often brings to recent graduates. Truthfully, I am really happy with where I am. Question: What’s your favorite CFC memory? Sloane: My favorite memory was on the night of the runway show, standing backstage and watching each collection as they took the stage. Seeing the show come together live validated all the hard work we’d put in for months, and it felt amazing to watch the audience experience our designers’ incredible work. I particularly remember standing backstage while Grace Lawson’s collection went on stage and locking eyes with Jessa, who was on the other side of the stage, and this incredible feeling washed over me like “wow, we did this!” It was without a doubt the highlight of my Cornell experience. 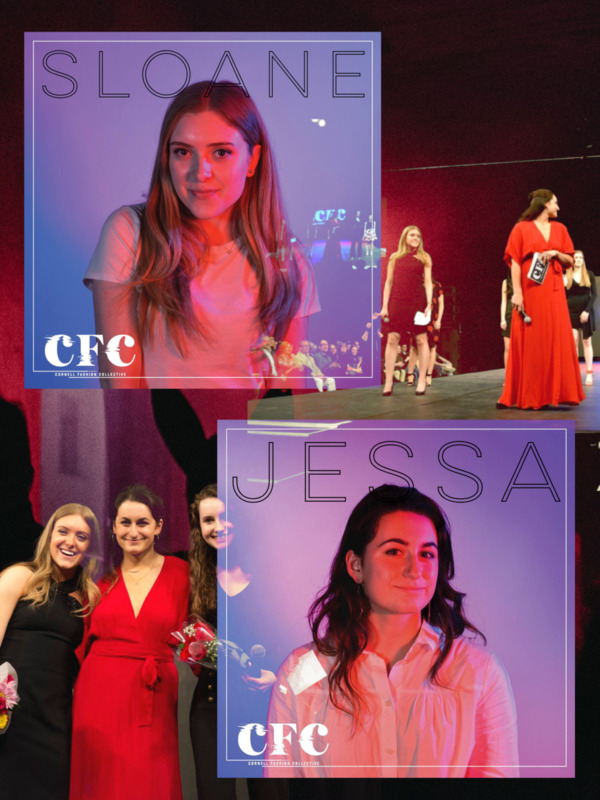 Jessa: It probably comes as no shock when I say that my senior year and time at Cornell University was greatly impacted by the Cornell Fashion Collective. It was an absolute honor to lead this organization as President, and it was a period of personal growth for myself. Truthfully, my favorite memory was having the opportunity to send out each model on to the runway for the sold-out crowd last March. Watching the beaming faces of the designers as their friends and models take the catwalk in their creations is a unique experience like no other, and it was truly an honor to watch the magical night come together, surpassing all of our expectations. Question:What have you learned from your experience as vice president/president of CFC? Sloane: My role in CFC taught me how to be an effective leader to all different kinds of people. Being the VP of Management and Finance allowed me to work on both the creative and financial sides of the show. Each side had different challenges and aspirations; the designers are really passionate about the beauty and excitement of the show, and the management team focuses in on the logistics, making sure the evening runs smoothly. I got to be a part of both thought processes, which taught me so much about compromise and balance. I also learned how to lead my peers, which was so challenging at first, but now being in the workplace and interacting with people of all ages, I’ve been able to continue building on the skills I developed as a leader of CFC. 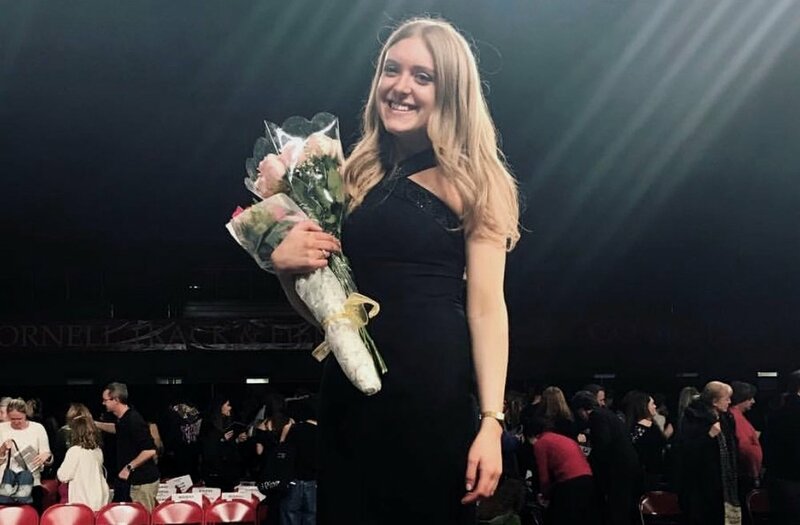 Jessa: As a past president of the Cornell Fashion Collective, I had to work with an array of personalities, something that prepared me for the professional workforce. I learned a lot about how I personally handle stress and planning, as well as how I can motivate my peers in unique ways. I've learned that I am a passionate leader who can benefit by listening to my team, and just because I have an idea of how to deal with a situation, sometimes others have more logical ways to handle a problem. Question: Do you have any advice for current CFC members? Sloane: I look back on my time at Cornell and think about the things that used to stress me out - exams, deadlines, late nights in Olin. Once you graduate, all those things seem so unimportant. I wish I’d spent more time on the things that made me happy. I found so much joy in my extracurriculars at Cornell, and while I wouldn’t downplay the importance of class, I would say that my clubs and leadership positions are what really prepared me to take on my life after college. So I guess my advice would be, throw yourself into your passion, spend your time doing what you love, and always leave your organization/club/team/group better than you found it. Jessa: Do not let yourself become complacent. If you create and lead based on what we "have always done", you will not advance the organization to the positive future we all foresee. Believe in yourself, because if you do, others will follow. Written by Melisa Kreismanis, @melisakreismanis on Instagram. Stephanie Langinestra is a Junior designing for the Cornell Fashion Collective’s 35th Annual Runway Show. She is an experienced Level 3 designer from the town of Fairfield, Connecticut and this will be her third year participating in the show. Langiestra is an Apparel Design major in the College of Human Ecology, and she is eager to showcase her five pieces and to exhibit her distinctive style. As a Level 3 designer, Langinestra had the freedom to focus her collection towards her own topic of interest. Her collection concentrates on three dimensional structure and space, inspired by the architecture and the commonalities between various forms of art. Langinestra wanted to bring attention to the idea that all art forms, whether it be fashion design or architecture, use dimensionality to create an emotional or thought provoking effect. The collection uses a subtle color palette of blacks, whites, greys, and blues in order to highlight the shape of the garments and create a strong emphasis on three dimensional structure. Langinestra is excited to see how her designs are going to be read by the audience and how people will interpret her collection. Captured by Jing Jiang (JJ), @jjingjjiang on Instagram. Follow Margaux at @margaux_neborak on Instagram. 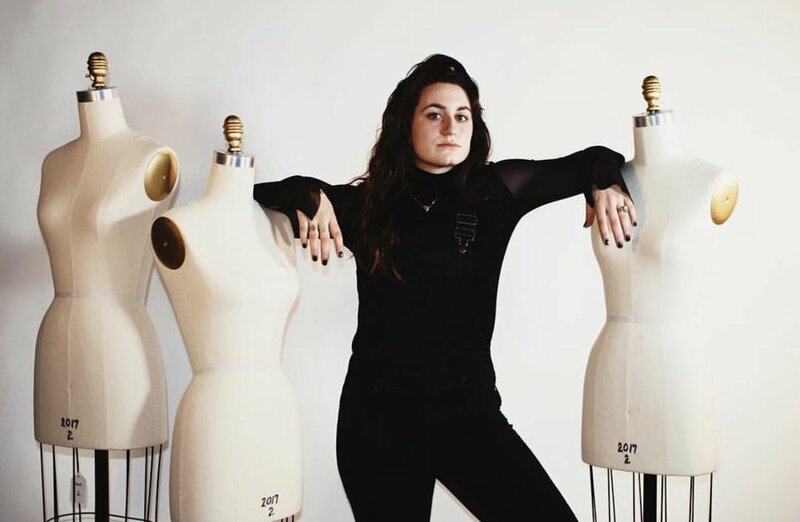 As a member of the Cornell Fashion Collective since her freshman year, Margaux Neborak revels in the creative freedom offered to her as a senior level 4 designer. Her love for fashion began in her high school design class – a love that has led her from sewing tote bags to designing luxe gowns. In her final collection for CFC, Neborak’s several years of experience will culminate in a truly sensational demonstration of her talent. 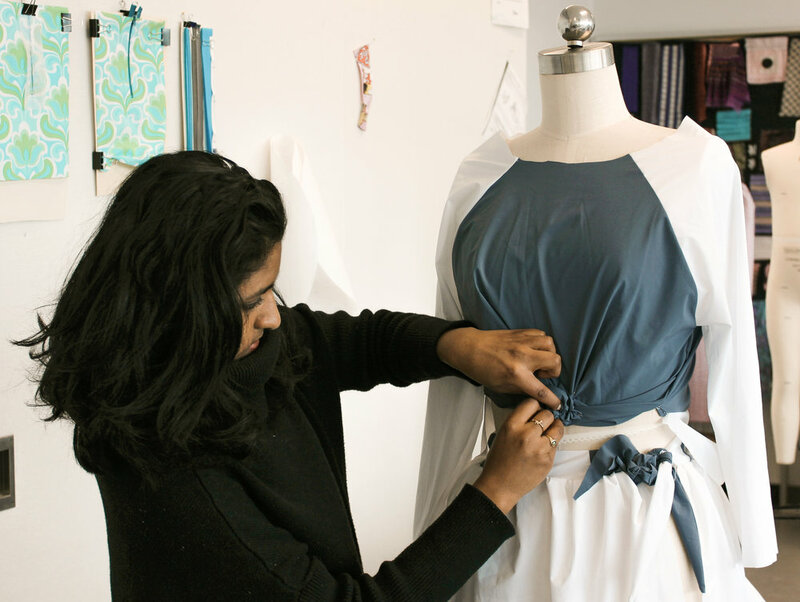 Over the last few years, Neborak’s time at Cornell has been supplemented with various internships that have shaped her signature style and passion for couture. Her most recent internship with Hayley Paige in New York this past summer catapulted her into the world of bridal design. Inspired by designers Monique Lhuillier and Vera Wang, Neborak sought to create her own line of bridalwear. Neborak’s collection will feature eight gowns that can be best described as nouveau niche: a modern take on the traditional wedding gown. Her central inspiration comes from the music genre of EDM, which emphasizes electric euphoria juxtaposed with organic repetition. Neborak hopes her designs will evoke the vibe of EDM through her use of geometry whilst still maintaining the ethereality of traditional bridal silhouettes. Neborak’s advice for young designers is to always take advantage of opportunities to be unconditionally creative. She appreciates the platform the Cornell Fashion Collective has given her to define her personal goals and interests and looks forward to sharing her final bridal collection at the show! Written by Anjali Velu, @avelua on Instagram. To see more of Margaux’s work, head to her website www.margauxfashiondesigns.com.